This weeks challenge from Strawberry Singh is quite the trip down memory lane and so much fun: first and recent! 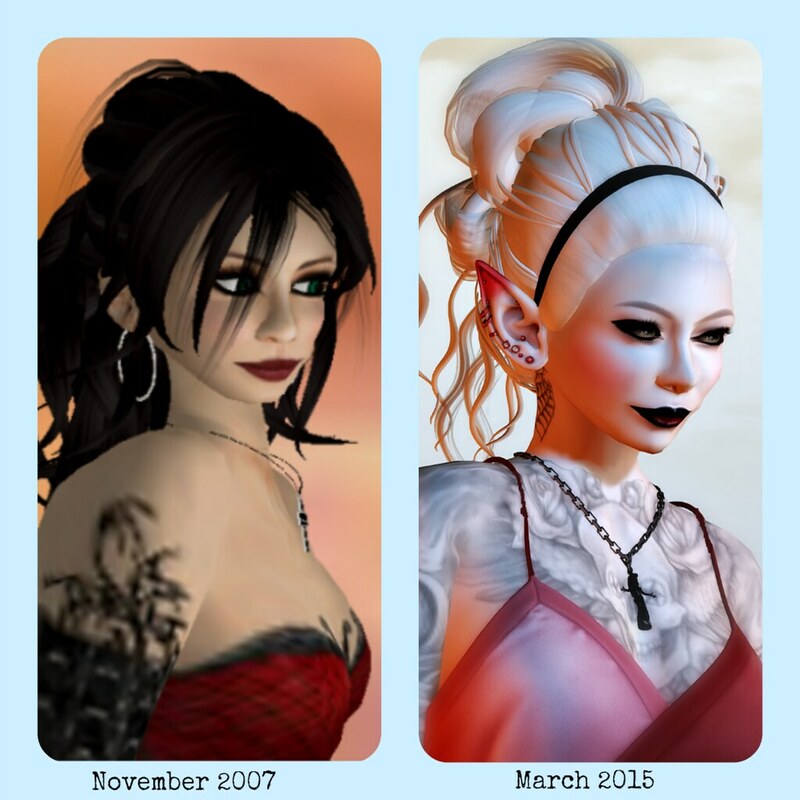 Meme instructions: Share a side by side comparison of your first blog picture beside a recent picture of your avatar. Don’t forget to share the link to your image in the comments and add your pictures to the Blog Memes flickr group. After the great Hard Disk Crash in 2012, ya know..the one I had NO back-up from..ahem, I lost tons and tons of my pictures..I got over that loss, it happened. Oh and I do back-ups now too. Doh. Anyway, luckily in 2007, when I was a young Caity, I had no idea you could save images to your Hard Disk anyway, so I have a lot of early pictures in my inventory! It took me a bit to find the oldest one, as I also wasn’t really good in renaming them – hence a folder filled with snapshots called : snapshot. Sigh. I found my first profile portrait though, it is from November 2007, and I remember I was actually quite proud of my super looks and thought I looked amazing! Calico hair, and my first tattoo! I am still wearing this shape, it’s tweaked over time, but it is still the ‘girl next door’ and if you look closely you see I was already modelling the face I have nowadays. Well I see it! A really great challenge, and don’t forget to have a look at all the other participants in the flickr-group!